It's been a couple weeks since I first recieved my Fuji XT-1, and I've been enjoying photography more than I have in quite a while. I relish the fact I can carry an entire camera system without feeling weighed down, in a small shoulder bag with room to spare for daily carry items. My camera is now becoming an essential item wherever I go, and that's something I couldn't do very well with my heavy, large Canon system. That's one of the reasons I bought a Panasonic GF1 when I first came out, and it was a great camera for it's time. My 7D put it's quality to shame, but now I have a small camera who's quality has been compared to full frame cameras. The real test comes this weekend, when I attend round 5 of Formula Drift at Evergreen Speedway in Monroe, WA. I've been an avid drift photographer in the past and evergreen is very familiar turf. This will be the first time I've shot drifting without a Canon SLR in tow. Panning will be a piece of cake with this camera, I'm curious to see if the autofocus can keep up in the infield, when you have cars coming at you sideways at 60+ mph. It will be a fun and informative weekend and I can't wait to share. I'll be writing an article for drifted.com and you'll be able to check out my select photographs there. Out of the box the camera itself looks fantastic, and the size is perfect, add the optional battery grip and it feels even better. I've always been a fan of bringing back the popular retro look of cameras, and the XT1 does that very well without sacrificing usability. I also bought a Gariz half leather case for it which adds to the look and gives you a bit more grip to hold. the case screws on, has a flush tripod mount, and you can still change the battery with it on. One of the issues I had read about was how the directional buttons on the back were "spongy" I'm not sure if the model I got was refined, but I can see what people meant by that. Personally, I had no issue with how they felt, I have cameras that have a definite click to its buttons, and sure, they could have made a more clickly waterproof button, but it's really not that bad and shouldn't be a deciding factor in the cameras itself. The SD card door is also a bit flimsy as people have said, but again, it’s really not that bad of an issue. I haven't shot a whole lot with the camera yet, but initial photos show me exactly what I had come to expect after reading the countless reviews and articles I found over the past few weeks leading up to the purchase. It shoots great, fast autofocus, sharp images. And that viewfinder. Wow. Bright, huge, sharp, and there's literally no lag. Once I have some more photos to share, I’ll write another article. As someone who's shot a lot of motorsports in the past, I’m interested how far I can push this thing. For now at least. Part of me felt like It was a burden holding me back at times, in the past year I've been hiking in the mountains a lot and it very apparent how having a large camera holds you back. What lens should I bring, the trusty and cheap 18-50 f2.8? But I want the best quality, so maybe throw in the 50 f1.2 as well, but what about those long shots? Bring the 70-200 as well? And then I realize I don't have the room with all the climbing gear I'm carrying as well. I always end up just bringing my waterproof Nikon AW110, which does produce a great image for its size, but I'm always wanting more quality. Canon as a system was great when I was doing more Motorsports work, but lately I've felt I've been not shooting for myself enough. 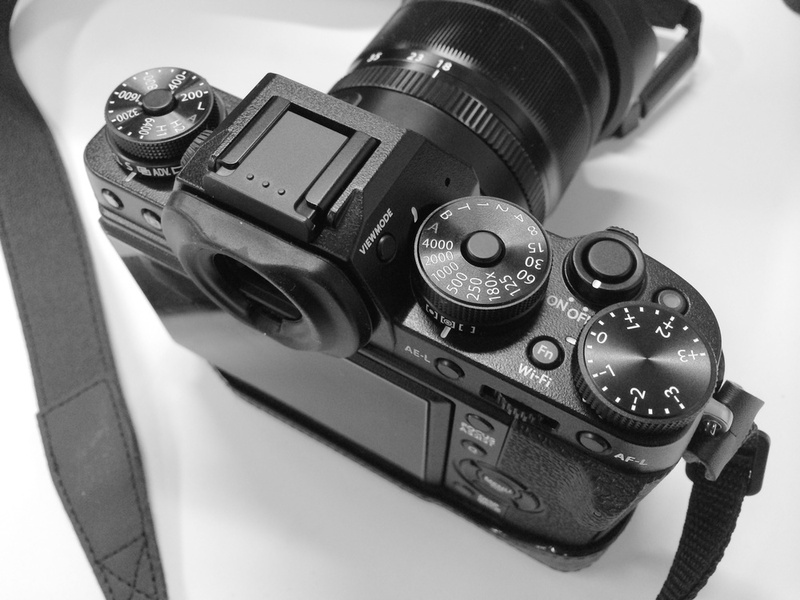 And that's why the Fuji XT-1 really peaked my interest, both for it's size and lens system. Camera arrives this week and I'm excited to get back out and shooting without lugging around an overly large camera bag. I've researched plenty on the camera and it's hitting many marks, and photographers around the world love it. I also own a Panasonic GF1, which was my first mirrorless camera and the technology has vastly improved since that came out. Looking foward to shooting with the XT-1 and showing the images it produces. Snow is fantastic. After hiking this past Thursday, I wanted to write up a little article about hiking mountains in the winter/spring, gear, clothing, and a general call to those who seek adventure in the mountains. I want to share my experiences with everyone. It’s been a while since I’ve witnessed the mountains get as cold as they have been lately, let alone hike in it. Temps ranging from -5F to 15F with hard packed icy conditions make things a bit challenging. Both for travel and staying warm. I was looking for a new pair of pants and jacket for this season, but after shopping around I realized I could stay warm for the cost of a single pair of pants or jacket you might look at on a trip to REI. Maybe someday I can justify spending $200-400 for a jacket, but I’d rather shop smart and save. Below is a list, starting with what I wear, optional gear, and the essential gear I never leave without. 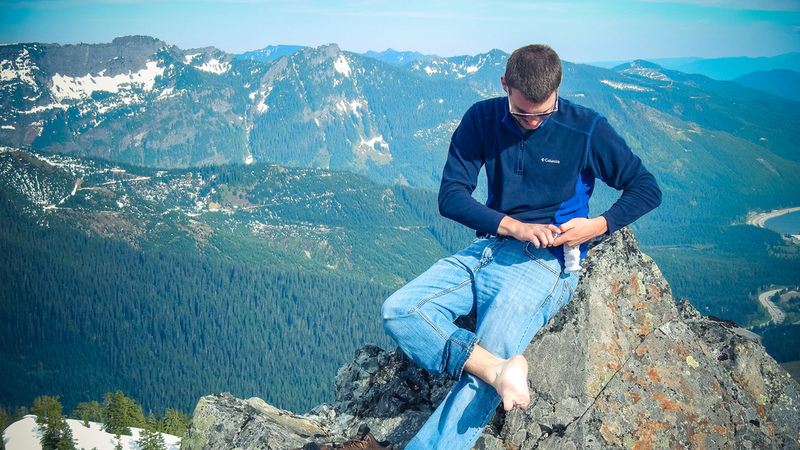 As far as general layering is concerned, you need to have a base layer (for managing moisture), Insulating layer (for the cold), and a shell layer (for wind, rain, and snow) No cotton, no jeans, no sweatshirts or t-shirts. You will be miserable. As Les Stroud says, “you sweat you die” There are times where you need to delayer, or put on more. For a more in-depth as what materials are recommended, check out this link: http://www.rei.com/learn/expert-advice/layering-basics.html Winter hiking is my favorite, and requires the most. Here’s my system. I’m skinny, so you may need less. Tested for warmth at 15 degrees December 5th hiking at Alpental/Denny Mountain. I took advantage of sales, gift cards, and off brand stuff without sacrificing too much. You may already own some of these as I did, just fill in the gaps where you're lacking. Even with temperatures around 15, I ditched my insulated shell and both gloves till we got about halfway up the mountain. As long as I kept moving I was generally warm enough and didn’t want to sweat too much. Once we stopped for a break and hot tea, I put those things back on. Looking back at the same area as the above photo, but from last thursday. As I stated earlier, I have never seen such cold constant temps in the mountains, the result was about 6 inches of fine grain powder on top of hard pack ice. 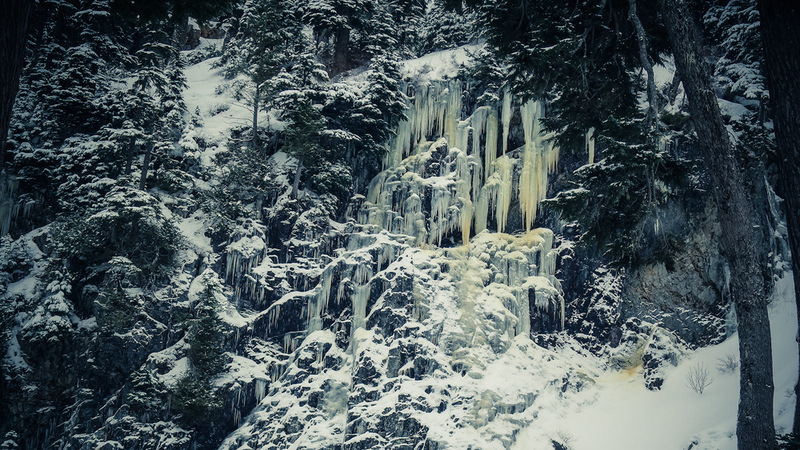 Ice formations everywhere and some of the largest icicle forests I have ever laid eyes on. (Never had an issue with water bottles freezing till that day either.) Not even 100 yards up the mountain we stopped to put on crampons, and busted out the trekking poles. Once we hit the first major slope we added an ice axe to the mix for more stability and in case of the need to self-arrest. Now, get that mentality of swinging an axe all over the place like you see in movies out of your head. 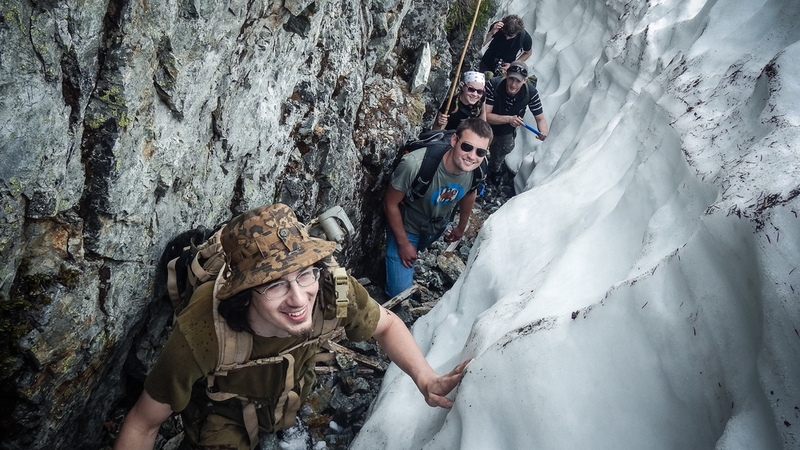 We’re not doing ice climbing or 80 degree slopes. 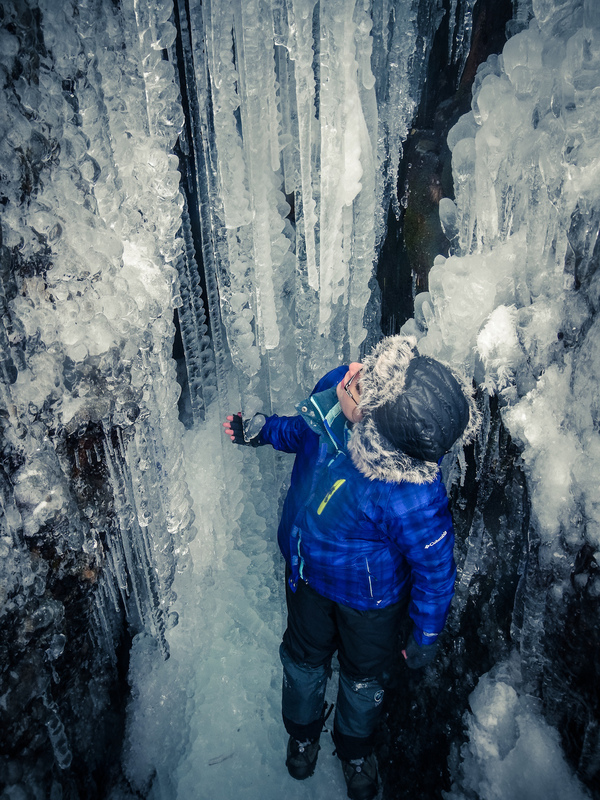 Ice axes/mountaineering axes (straight shaft) are used like a walking stick with the adze facing forward, ready for a proper self-arrest should you slip and start sliding down a slope. 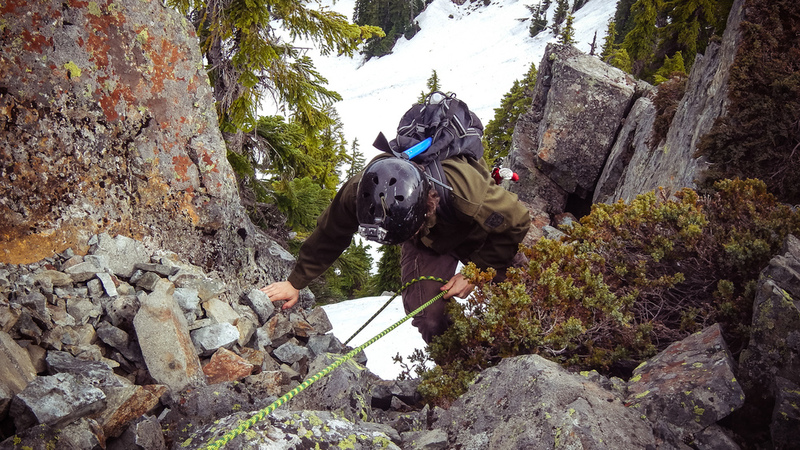 As people get more comfortable with steeper slopes, thats where you want to bust out a pair of technical tools, I bought a pair of Petzl Nomics up Guye Peak shown in the below photo. It did make certain moves easier, and I felt more secure and attached to the mountain. Check out the video below for a great explanation and technique for self arresting. You can find Chinese brand 10 point crampons on Ebay for less than 40 bucks. I bought 2 pairs. They look like some $100+ models, but lack certain refinements. The front points are only about half as long as regular ones, but then again I'm not taking people up crazy steep slopes or ice. They just make walking incredibly easy, more traction for slopes, and you feel like a BAMF Mountaineer. Higher end crampons require a special boot with a front and rear lip, which my current boots lack, So I was happy to find these Chinese crampons that could be fitted to a wide range of boot sizes. I put my money in ice axes, because it’s a more crucial tool in my opinion, and I want to be able to lend some out. I currently own 3 regular axes of various length, and 2 pairs of technical axes. 2x Nalgene bottles, 1 has a metal cup that fits around the base for storage. Spare clothes (socks, hat, gloves, top and bottom base layer. 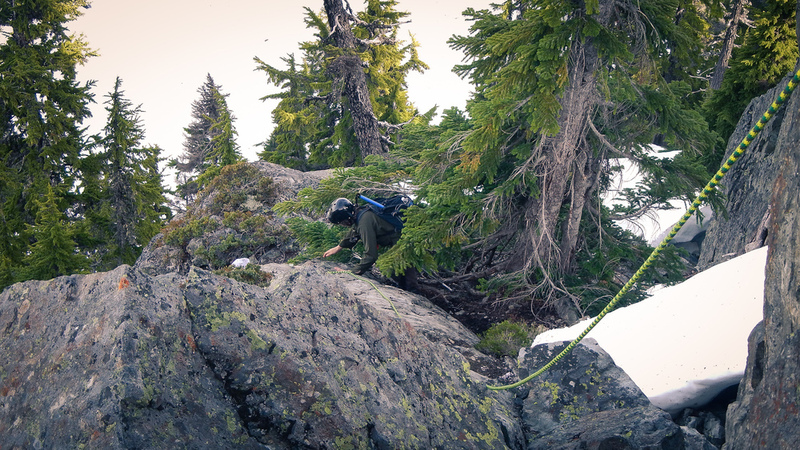 We got a tad lost on Guye Peak last year, ended up doing multiple rappels for a faster descent. A few different sizes of nuts and quick draws to go with. Nothing too insane, unlike the mountains that would require cams, ice screws, pitons, crevasse knowledge, etc for safe climbing, which I hope to do someday. 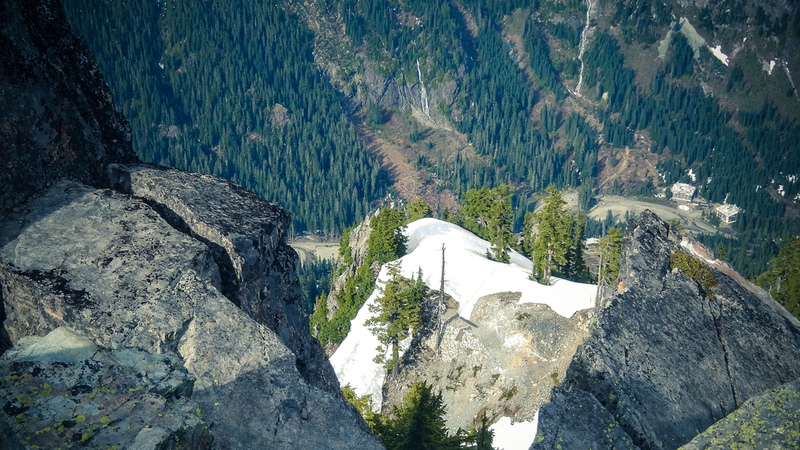 The Snoqualmie area will always be able to provide a good solid days worth of hiking, in a relatively safe environment. There's plenty of shinanagins you can get yourself into. I try and pack for whatever possible dangerfull adventures we might come across, there are times where we randomly do some unnecessary rock climbing instead of taking a longer route, rappelling to get off the mountain after taking the wrong way down, but it all comes down to route planning and what everyone in the group is comfortable doing. Think you’re not ready? 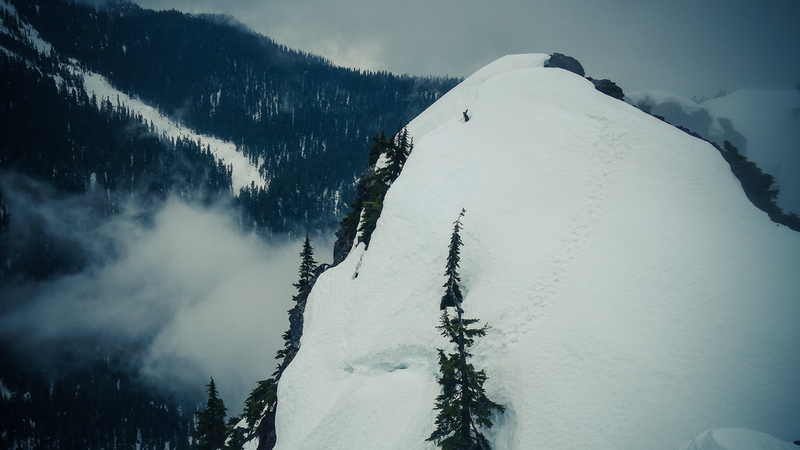 I took 4 people who had never been mountain climbing up Alpental, which is one of Snoqualmie’s ski areas and is very rewarding, and safe. It’s only when you start navigating the crack system at the very top to get to the peak do you become a bit exposed to the sheer drops and slopes found on mountain peaks. Common sense and endurance play a major role. 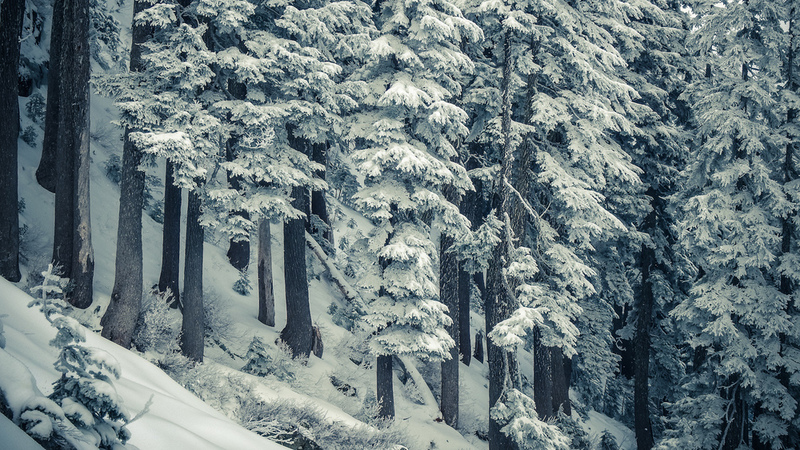 If you’re not up to hiking in the winter, wait till spring. The slopes will still be covered for the most part, and you get the added benefit of it being a bit warm. Still avoid cotton, jeans, t-shirts, and sweatshirts, once you get wet from sweat you will regret it. The mountains are a beautiful place to ascend, especially in the winter. I’ve never been at peace with myself as much as I have standing on the top of a mountain peak looking down at the planet. It’s always a surreal accomplishment and that’s what keeps me going back; the friends, the views, the challenges, and the resulting photos. If you have any questions where I bought any of the above, or what you should be looking at, feel free to get at me. I’ve become pretty proficient in finding a cheaper alternatives to certain brand name items. Example: Almost bought a pair of gaiters for $60, found a pair online that worked incredibly well for $12 shipped. $40 crampons? Thanks China. Sometimes you gotta take a chance and try some cheap crap out that turns out working great. I've done it a bunch.